The Taima Mandala is a pictorial depiction of the teachings of Japanese Pure Land Buddhism showing primarily the Pure Land Paradise of Amida based on the Commentary on the Meditation Sutra by the monk Shandao from Tang Dynasty China. The work has been passed down by the Taima-dera temple in Nara, leading to its name. Vast numbers of works depicted the same images even in later ages and can be found around the country, but the basis for these works is the Taima Mandala, which the Institute studied. The massive work has been designated a National Treasure and extends more than 4 meters in width and height. The work is thought to have been produced in the 8th century, though some believe it to have been produced in Tang China while others think it was produced in Nara. A major feature of this key mandala is that scenes are depicted by weaving, i.e. figured brocade, rather than pictures painted on silk canvas, as was normally the case. However, the work has unquestionably deteriorated over a span of more than 1000 years. Massive restoration in the Kamakura and Edo periods only just managed to keep the work intact. Scenes are apparent as a result of patching that was done during those periods, but the ground weave has been severely damaged. The extent of original figured brocade that remained and the features of that brocade were somewhat unclear. The mandala had long been out of public view, but the mandala was slated for exhibition during a special exhibition, Taima-dera Temple, by the Nara National Museum starting on April 6 of this year. 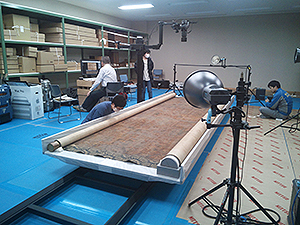 Prior to exhibition, the Institute’s Department of Art Research, Archives, and Information Systems conducted an optical study of the mandala from December 17 to 21, 2012 at the Nara National Museum as part of a joint research project with the Nara National Museum. SHIRONO Seiji, KOBAYASHI Koji, SARAI Mai, and KOBAYASHI Tatsuro of the Department of Art Research, Archives, and Information Systems participated in the study. A railed platform was crafted for extensive photography. The work was placed on the platform and then photographed with a high-definition digital camera. The total surface of the work was divided into close to 150 segments, allowing viewing of the extremely elaborate weaving of the mandala. High-definition digital images were taken with visible light, and sections were photographed in greater detail with fluorescence and infrared light. During the study, macro-photographs were taken on portions where the original figured brocade appeared to have survived. Very few portions were found to have the original weave of the figured brocade, providing a key springboard for future studies. This study also helped to facilitate exhibition of the work at the Nara National Museum.